As an elementary school teacher, I see it all when it comes to lunches. I’m never surprised anymore to see what combinations students and their parents come up with. Some of the more creative ideas have involved using Fruit Roll-Ups and fruit snacks in place of jelly on a PB & J, and, my favorite, a mustard, Fruit Roll-Up, pickle, and peanut butter sandwich. Oh. My. I know making lunches can be crazy and rushed but I’ve found over the years with my own boys (and slightly more organized students) that there are a few tricks to using packaged foods to keep the job simple and even healthy. Here are 10 deliciously healthy (packaged!) foods for kids lunches. Use packaged flatbread to make a much healthier version of sodium-loaded stackable lunch kits. I like to use fresh mozzarella balls, cherry tomatoes instead of fakey tomato paste, and fresh herbs. My boys LOVE these pizzas! Our favorite flat bread brand is Flatout. Find some fun recipes on their website here. What, with all the added sugars, hydrogenated oils, and preservatives, I’ve never loved the idea of giving my boys too many packaged sauces and dips. I don’t worry so much when it comes to basic ingredient hummus. Packaged hummus with fresh veggies makes for a great side in kids’ lunches! I trust Simple Truth hummus for quality and taste. Ever have left over ingredients from party meat and cheese trays? Use chunked deli meat and veggies from party trays as fillers for healthy kid-approved lettuce wraps. My family has enjoyed these so much that I now buy party trays just to make lettuce wraps for all of our lunches! Packaged tuna in water is about as lean and clean as it gets when it comes to meats and proteins. Mix your favorite tuna with tomato, lettuce, and ripe avocado all on whole grain bread. Your kids will be asking for it for dinner as well! Recipe. Fill packaged pita pockets with your kids’ favorite sandwich fillers for a fast and tasty pre-cut, crust-free lunch. We love Ezekiel 4:9 pitas in our house! Find 10 delicious pocket recipes here. For an even easier way to make yummy pita pockets, simply fill the pitas with on-the-go salad kits. For a most quick and delicious fruit dip, just peel open a single serve tub of Greek yogurt. What an easy way to add a little extra dessert appeal to already tempting fruit! If you have a few spare minutes, try whipping up this A-MAZ-ING peanut butter Greek yogurt dip. Fage brand also shares Greek yogurt dip recipes here. If you haven’t discovered ready pasta yet, you’re going to be thanking me. Barilla brand sells pre-cooked penne, rotini, pasta elbows, and gemelli that can easily be tossed together in a mason jar with veggies and a sauce. 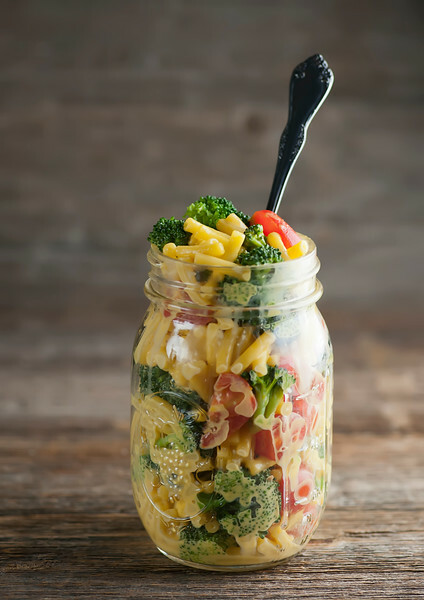 Your kids will love that they get mac & cheese and you’ll love that you can fill their tummies with wholesome veggies! Find more details here. Cream cheese and pre-sliced deli meats make for this kid-favorite finger food. Add sliced pickles for a bit of crunch and saltiness. My boys have loved eating these since they were toddlers. Source. Packaged raw nuts, dried fruits, and pre-popped popcorn are all perfect choices for a healthy trail mix lunch snack. You can but don’t have to add a bit of sweetness with chocolate chips or candies. We really like Simply Balanced lightly salted popcorn, but here’s a complete guide to all the best ready-to-eat popcorn brands. Mom Spotted shares this tasty popcorn trail mix recipe on her blog. To cut back on unnecessary preservatives, I try to make my own homemade version of packaged foods as much as possible. But Justin’s nut butter snack packs are one exception I have no problem buying! Super tasty and perfectly portioned, these will be an instant hit with your kids as a lunch time favorite. Great post! This is perfect! My kids love these so much! I’m glad they like them! Thanks for sharing this healthy meal list. Id like to star with the Avocado Tuna Sandwich, avocado has been a good source of fiber for me and it has helped me with digestion.